Few weeks after her younger sister Chikodi Nnanna married an Oyinbo man, Paul Francios Wildenberg from Netherlands in Ikeja Lagos, Nollywood actress Uchenna Nnanna has secretly married her fiance, a Spain-based big boy named Richard Uchechukwu Maduka who hails from Abia State. 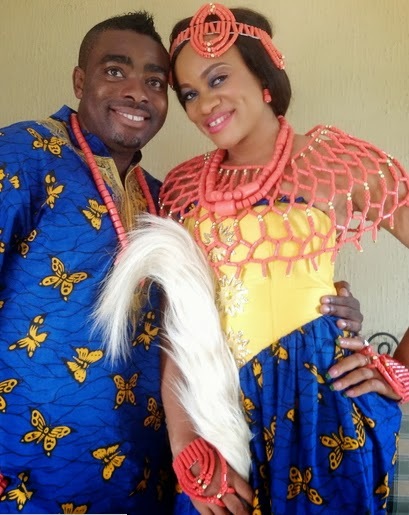 According to sources, the beautiful actress and her boo are currently doing a secret traditional wedding at Ihechiowa in Arochukwu LGA of Abia state. Congrats to Uchenna Nnanna and her husband. Good’what God has joined 2gether let no mouth put assunder. U go uche,God is he who he.ils this not d same girl that d jobless confused animalsenseless holigan called bezo. wanted to dent her image.she is married to man not a boy. A working class man while bezo is still mama and pspa thank u,soup still deyI no fit my garri bcos. d soup small and I even add am and salt. this same fool called. bezo. can’t. afford a bar soap to wash his clothes.I don’t why d low lives d are d one that that make d most noise to cover d pain and wrecks in their no direction life moving about d village. looking. kids to use while really are out there making. a name money up their upgrade themselves. while people likes of bezo. are moving from one internet to another that have power suppy. u better go and ask uche. forgiven and if she will find d smaller position for u in her husband office u.uche d human heart is television for u to. turn on and am happy for.married life my dear.its well. Sorry guys made a whole lot of mistakes pening. this when I found that bezo was a very poor smiling moron whose family is d pillar of abused in d making. I wasted some money trying to fish him out only to find yoruba ant beneath my flip on. For other yoruba pepple,please d above topic have nothing to do with you or his parents and friend. @bezo uche is not what u think she is a nice girl, even when she was young,very good family.am happy with u uche even chikaodi.to show that God is alife upon all the lost in the family.HML. Congrats gurl. Be a good mother and wife anytime, anywhere. Make God’s word your focus and foundation in your marriage. Bezo i can see that u r under some evil causes, enemy of progressive. May God just have mercy upon u and deliver u. My dear Uche, congrats!HML and all d best. oooohhhhhhhhhhhhhhhhhhhhhhhh Uche babe im soooooooooooooooooo happy for you. Go girlllllllllllllllllllllllllll. Haters back off. whatever you say now or even before makes no difference. one with God is majority. i adore you girl. HML OH jare. Love conquers, Uche and Hubby, dont listen to jagons. They are unfounded distractions. just move on beautiful people! HML. i am your die hard fan. Remember me, i am of the people that snaped picture with you at the eleko beach in lekki when you came there with those two oyibo boys last month. so happy for you.